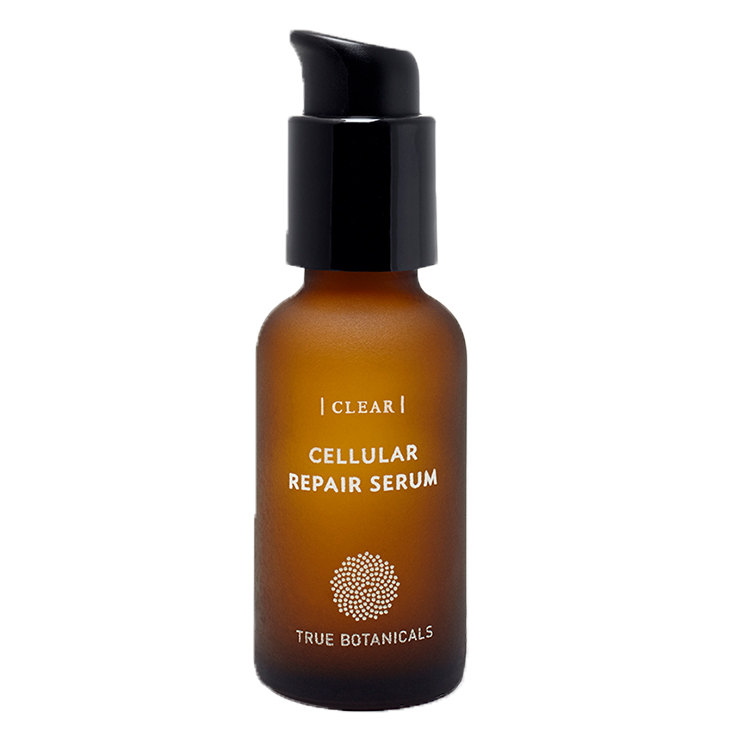 Wake up to a clear, healthy looking complexion with True Botanicals Clear Cellular Repair Serum. Designed to address signs of congestion and acne overnight, this face serum is made with astringent green and white tea leaf extract to lend a toning and calming effect to skin. Hyaluronic acid keeps oil production feeling balanced without making skin feel overly dry or irritated. Black willow bark extract lends a smoothed feel to skin, improving the look of roughness, uneven skin tone, and wrinkles. Olive leaf extract keeps skin looking clear and youthful. Apply a thin layer of serum to face, neck, and chest after cleansing and moisturizing skin. For best results, use nightly. Camellia Sinensis (Green And White Tea) Leaf Extract*, True Botanicals Bioferment™ [Water, Alaria (Seaweed), Sodium Choride], Santalum Album (Sandalwood) Water, Glycerin (Vegetable Glycerin)*, Curbita Pepo (Pumpkin) Seed Oil*, Squalene (From Olives), Glucosamine, Tocopherol (Non-GMO Vitamin E), Algin (Seaweed), Niacinamide, Phenethyl Alcohol**, Salix Nigra (Black Willow) Bark Extract, Helichrysum Stoechas (Helichrysum) Extract, Olea Europaea (Olive) Leaf Extract, Sodium Hyaluronate (Ultra Low Weight Hyaluronic Acid), Magnesium Ascorbyl Phosphate (Vitamin C), Ethylhexylglycerin**, Rosemary Officinalis (Rosemary) Leaf Extract, Xanthan Gum, Propanediol, Lavandula Hybrida (Lavender) Oil, Helichrysum Italicum (Helichrysum) Flower Oil.